The first fire engines, which appeared in the 17th century, were simply tubs carried on runners, long poles, or wheels; water was still supplied to the fire site by bucket brigade. The tub functioned as a reservoir and sometimes housed a hand-operated pump that forced water through a pipe or nozzle to waiting buckets. The invention of a hand-stitched leather hosepipe in the Netherlands about 1672 enabled fire fighters to work closer to the fire without endangering their engines and to increase the accuracy of water placement. At about the same time the development of pumping devices made it possible to draw water from rivers and ponds. In the early 19th century copper rivets replaced the stitching on hoses, and 15-m (50-ft) lengths coupled with brass fittings enabled fire fighters to convey water through narrow passages, up stairways, and into buildings, while the pumps operated in the street. Cotton-covered rubber hose was developed around 1870. The steam-pump fire engine, introduced in London in 1829 by John Ericsson and John Braithwaite, was used in many large cities by the 1850s. Most steam pumpers were equipped with reciprocating piston pumps, although a few rotary pumps were used. Some were self-propelled, but most used horses for propulsion, conserving steam pressure for the pump. Steam fire engines were used in fighting the Chicago fire of 1871. With the development of the internal-combustion engine early in the 20th century, pumpers became motorized. Because of problems in adapting geared rotary gasoline engines to pumps, the first gasoline-powered fire engines had two motors, one to drive the pump and the other to propel the vehicle. The first pumper using a single engine for pumping and propulsion was manufactured in the United States in 1907. By 1925 the steam pumper had been completely replaced by motorized pumpers. The pumps were originally of the piston or reciprocating type, but these were gradually replaced by rotary pumps and finally by centrifugal pumps, used by most modern pumpers. 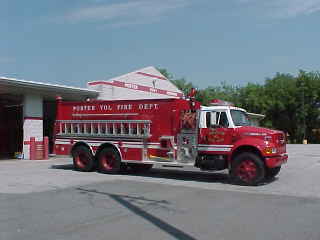 At the same time, the pumper acquired its main characteristics: a powerful pump that can supply water in a large range of volumes and pressures; several thousand feet of fire hose, with short lengths of large-diameter hose for attachment to hydrants; and a water tank for the initial attack on a fire while fire fighters connect the pump to hydrants, and for areas where no water supply is available. In rural areas, pumpers carry suction hose to draw water from rivers and ponds. 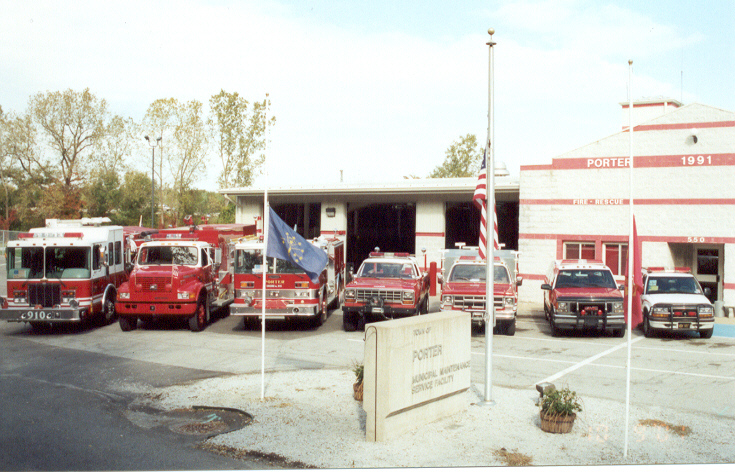 Current standards for pumper fire apparatus require that a fire pump have a minimum capacity of 2840 liters (750 gallons)per minute at a pump pressure of 10.35 bar (150 psi). They also call for a water tank capacity of at least 1893 liters (500 gallons). 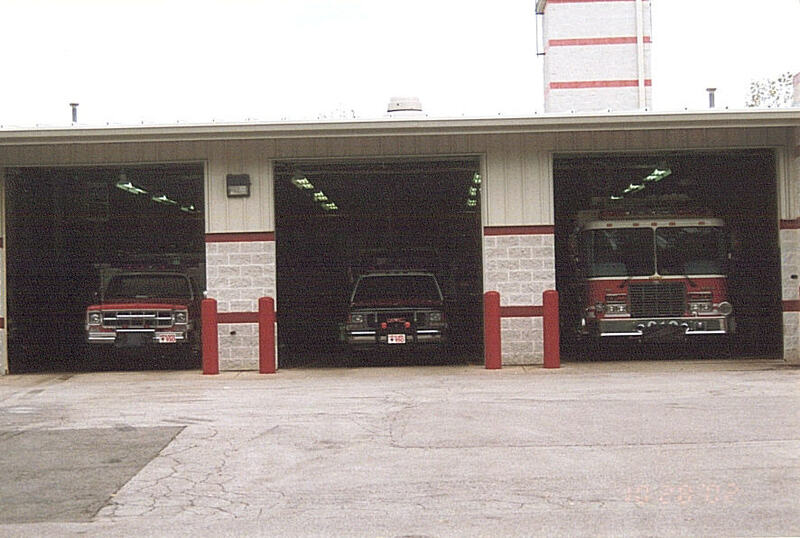 Auxiliary vehicles are equipped with specialized equipment for effecting rescue, ventilating buildings, and salvage. Aerial ladders that typically extend to 30.5 m (100 ft) are carried on �hook and ladder� vehicles that also hold various kinds of tools and equipment, including heavy-duty jacks and air bags, extrication tools, oxyacetylene torches, self-contained breathing apparatus, and resuscitators. Other more basic equipment includes axes, shovels, picks, battering rams, power saws, hooks, and wrenches. Elevating platform trucks can raise fire fighters and equipment, including the water delivery system, as high as 30.5 m (100 ft). 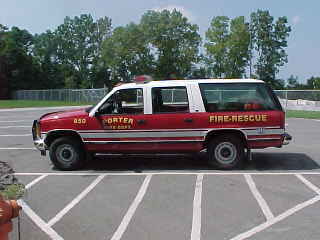 Rescue trucks carry a wide assortment of specialized emergency equipment, including the type that might be used in building collapses and cave-ins. Field communications units carry sophisticated electronic equipment for use in managing fire and emergency operations. Salvage trucks carry implements for reducing water damage, including large waterproof covers, dewatering devices, and tools for shutting off water flow from sprinkler heads. Hazardous materials response units are staffed with specially trained personnel equipped with protective clothing and monitoring devices for use at chemical spills and similar incidents.